Works to upgrade Pinjar Road in Mariginiup will begin in April after the City of Wanneroo Council endorsed the award of a construction tender to RJ Vincent during its March meeting. (L-R) Peet Regional Manager Development Paul Lakey, Mayor Tracey Roberts, City of Wanneroo CEO Daniel Simms & Satterley Project Director Grant Wilkins. A 2.5km stretch of Pinjar Road is being upgraded to a four-lane dual carriageway from Blackberry Drive to Joondalup Drive. Covering five intersections, the works will improve the safety and capacity of Pinjar Road, provide local transport links to Banksia Grove as well as connections to the east and the north of the State via Neaves Road. Mayor Tracey Roberts said the City was committed to delivering local transport infrastructure to improve accessibility for its community. “Connectedness is a key to building strong communities,” Mayor Roberts said. “This upgrade of Pinjar Road will have a positive effect on the local economy, supporting our agricultural and resource sectors and the future Neerabup Industrial Area,” she said. Mayor Roberts said the City had successfully applied for a State Government grant to help fund the upgrade. 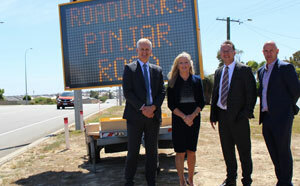 “We thank the State Government for the $3.6 million grant through its Road Improvement Program, which reinforces the significance of Pinjar Road to the City of Wanneroo as well as the wider region,” Mayor Roberts said. Peet Managing Director and CEO Brendan Gore said he welcomed this announcement, and the investment being made in transport infrastructure by the City of Wanneroo and the State Government. “These works will have a positive impact for the region, improving connectivity and travel times for residents, including those living in our award-winning communities of Carramar Golf Course Estate and Ashton Heights,” he said. The $6.5 million project is expected to be complete by the end of 2019.